The trip got off to a good start as I arrived at the airport, handed in my itinerary and the lady says, "Im sorry sir but this ticket is for yesterdays flight"..... Yes thats right, I arrived at the airport a day later than I should have. Great. After a good hard training cycle on the home woody my body felt ready to return to Mount Arapiles and face its unique funkiness that had beaten me, the last time. Feeling stronger than ever and super psyched I arrived back at the campground of 'The Gums', where I was to live for at least the next three weeks. I had given myself just over three weeks to achieve only one major goal. It was to climb 'Punks In The Gym' (32/8b+). A major classic put up by legendary Wolfgang Güllich in 1985. 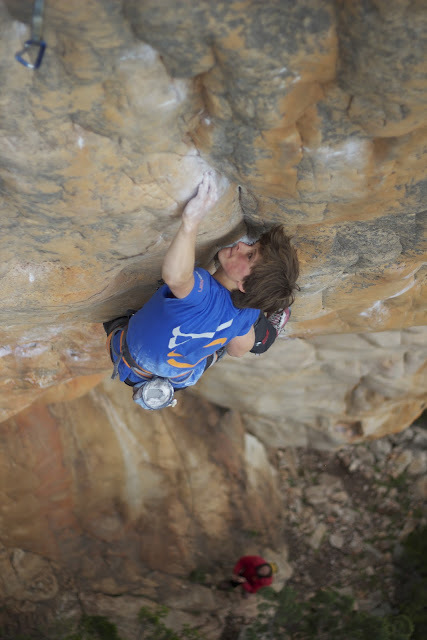 The worlds first 32/8b+. I had tried this climb a few times on my previous trip in the winter but was forced to leave with it unfinished. It was hard to handle at the time but I guess it was a good thing in a way as it got me super psyched to train extra hard and return as soon as possible. I must have done something right because this time, on my second day climbing and second or third (can't remember) shot of the day it was over. I had done Punks In the Gym. Becoming the youngest person and third kiwi or first Welsh to do so :) This was me first 32/8B+! Rock and Ice news feed! Another awesome place I really enjoyed was Muline. 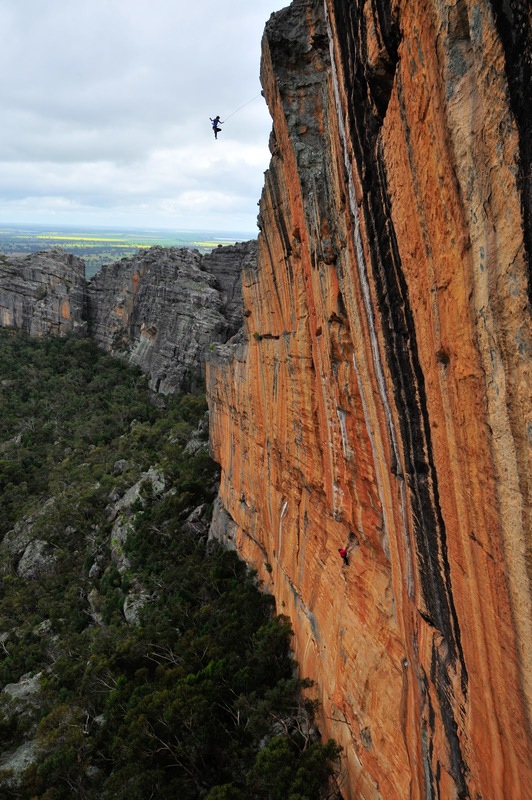 A steep overhanging cliff in the southern Grampians, home to many amazing climbs. One climb in particular stood out called Eye Of The Tiger (29/8a). I heard that it was really good by many people and a few had mentioned that it would be a good one for me to on-sight. I only climbed hear the one time but really enjoyed it. After arriving at the base of the crag tired and sweaty as hell (after crawling up the access track) I glanced up and was excited to see some holds that I could actually pull down on. It was a good change from the featureless slabs of Arapiles. The main goal of the day was Eye Of The Tiger and after a few laps on the warm up climb I was all geared up and ready to go. I had decided to go for the on-sight, so I was up first. The hardest thing about doing this was planning on where to place the long quickdraws. This was important as it goes through a steep roof and then out on to a head wall and who likes rope drag! I reached the halfway point of the climb and my arms were feeling good but god dam my right leg was tired. The climb follows a slopey left curving rail forcing many right heel hooks in a row. After a few leg shakes I was ready to attack what I had thought was the crux, a long reach to a slopey gaston with some crazy toe hooks but I did not know about this method and swung my feet across using a really wide left pinch (defintely not the right way). From here I hoped the hardest bit was over and I just kept my head together tick-tacking my way up the head wall (almost falling off the last move) fighting the pump. 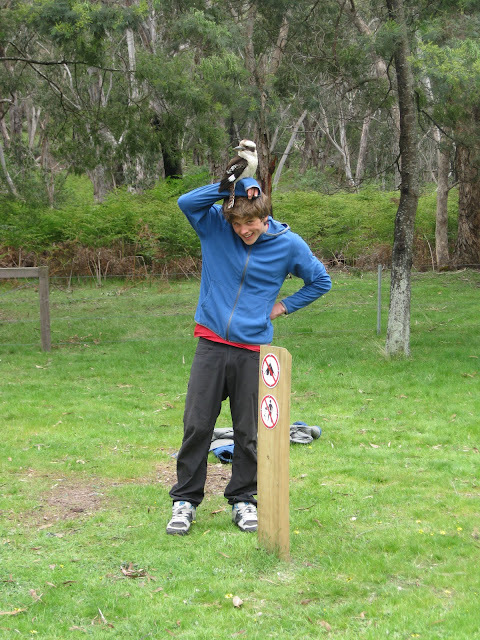 Before long i found my self clipping the chains of my first on-sight of a 29/8a 'Eye Of The Tiger'. After this my three weeks were coming to an end and I was having far too much fun living in the dirt, bin diving, and meeting many awesome people to go back so I contacted home. " Hey dad can i stay for longer..... ?" After lots of emailing i exended my flights for two weeks longer and it was definitely a good idea. This extra two weeks allowed me to finish off some projects and get lots of really good climbing done. I had been working on a climb called Snakes On A Train (32/8b+) on Taipan Wall. 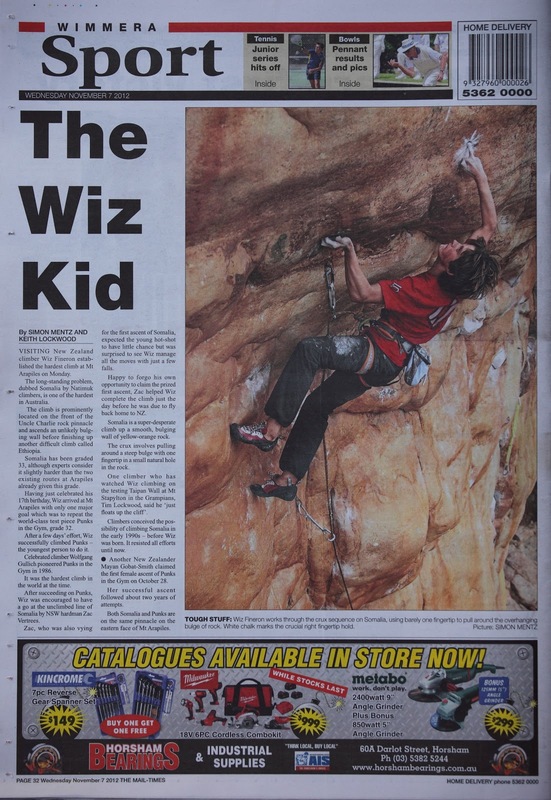 A new addition to the wall and was still awaiting a second ascent. After falling off at the last clip on my second go I really had to get it done (expecting to get it next shot). A few weekends later and many massive whippers (typical taipan style) it was done. I had done the second ascent and also my second 32/8b+. For the rest of the trip i decided to stay at Arapiles (no more trips to the Grampians) and set my targets on an unclimbed project called Somalia. 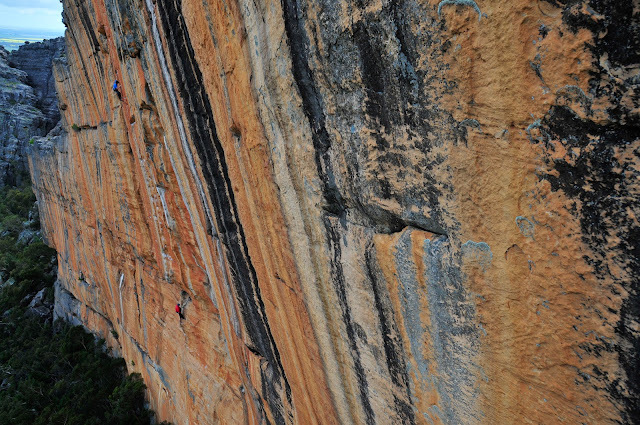 The climb is situated on the front face of the Uncle Charlies pinnacle at Mount Arapiles (Just around the corner from 'Punks In The Gym') and takes an unlikely looking line through a steep bulge before finishing up another amazing line called Ethiopia (30). The hardest thing about doing this climb was keeping my skin at a bearable level to hold the crystally crimps (the usual story I guess) not to mention pulling down on the one pad one finger pocket! It was the first time that I had been on a climb that included a mono and was very careful on all of my attempts making sure that my fingers were still all in one piece. A good friend of mine, Zac Vertrees, who had been working it at the time told me to give it a go just to see how I went. So I did. Surprising my self and Zac, thanks to all the Beta from him, I managed to do all the individual moves fairly quickly (linking them was a total different story) and that was it, I was hooked. It became a bit nerve-racking towards the final few days of the trip as it still had not been done. After a few crucial rest days it was down to the final day and good god was I nervous. I managed to keep my calm and on the third and probably final shot of the day (due to fingers reaching the point of no repair) it was done. Somalia (33/5.14b/8c) One of, if not the, hardest route in the park. After a few weeks back home, exams done and school is finally over, I'm off to Hueco Tanks! Peace out! Im 19 years of age and live in New Zealand after moving here from Wales, UK in 2007. I am a very passionate climber and am now in the process of doing what I have always dreamed of doing, traveling the world climbing everyday! Living the dream.